Event Really Gets Off the Ground! You quickly realize this is not just a fireworks show…this is an experience! The sheer amount of fireworks detonating simultaneously is hard to comprehend. The ground seems to shake as they launch from the barges in the Ohio River, right in front of you. They echo like cannons down the river and you feel a thud in your gut as if you’ve been hit. You are not a spectator…you are part of the moment, drawn into it with all your senses. Thunder Over Louisville is the premier event kicking off weeks of festivities leading up to the Kentucky Derby. It’s also North America’s largest fireworks display. 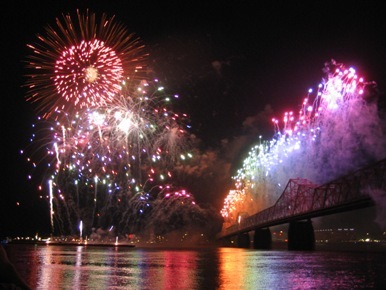 Two enormous barges anchored on both sides of the 2nd Street Bridge, and the bridge itself, detonate a grand display set to music. At last year’s show, 56,000 shells were detonated and 4,000 shells were ignited for the grand finale in the last 20 seconds alone. During the day Thunder hosts an impressive air show flying everything from vintage aircraft to the military’s finest. Included are stunt helicopters, parachute teams, river drops, Coast Guard rescues, precision flying teams, biplane rolls and more. Definitely impressive. And equally impressive: both events are completely free! Biggest tip for Thunder? Come early. Park well outside of the downtown area and walk in. Congestion afterwards can be gridlock. There are plenty of food vendors but lots of people bring their own coolers. Have blankets or lawn chairs and plan to be outside for the day. The weather can vary at this time of the year. This year’s date is Saturday, April 16. Thunder Over Louisville is a don’t miss event!